Twelve species of lionfish live in the Indo-Pacific, but only two closely related ones were thought to comprise the lionfish invasion: red lionfish, Pterois volitans, and common lionfish, Pterois miles. Most of the western Atlantic invaders were identified as red lionfish, though the two lionfish are almost indistinguishable in appearance. For the past decade, marine biologists studying the lionfish invasion have assumed that most of the invaders are red lionfish. But a new study, recently published in the Journal of Heredity, flips the whole situation on its head. As a team of researchers from the University of Hawai‘i and Japan’s Kochi University and the Kagoshima University Museum have discovered, the red lionfish isn’t even a species at all. Instead, it is a hybrid of two other lionfish species—P. miles from the Indian Ocean; and the Russell’s lionfish, Pterois russelii, from the Pacific. So in some sense, the lionfish taking over the western Atlantic are not an invasive species—they’re an invasive hybrid. It’s a situation never before seen in a marine biological invasion. This revelation may help explain the lionfish’s staggering success as an invader by hinting at secrets hidden in its genes. The scientists made their discovery following an analysis of the invasive lionfish’s nuclear DNA. Past genetic studies on the fish have focused on their mitochondrial DNA. While much easier for scientists to collect, mitochondrial DNA—which is found in an animal’s mitochondria, and is passed down from mother to offspring—represents only a fraction of an organism’s genetic family tree. Nuclear DNA, found in the nucleus, gives a more complete representation of a fish’s genetic diversity. Recent advances in sequencing technology allowed the researchers to analyze the nuclear DNA of 286 lionfish that were collected from three oceans over the past decade. The scientists found that of the invasive lionfish in the Atlantic Ocean, 89 percent were the Indo-Pacific hybrids. Even in the Pacific and Indian Oceans, these hybrids occupy an expansive range, stretching from the eastern Indian Ocean to Japan to the South Pacific. Based on their prolific success in both native and invaded waters, the scientists suggest these hybrid lionfish may be benefiting from a process called heterosis, which occurs when the offspring of genetically dissimilar parents—such as a mutt born from two different kinds of purebred dog—is healthier and more fit than its parents. Crossbreeding doesn’t always cause heterosis, but it can weed out harmful genes from inbreeding, or amplify beneficial genes. Though the researchers didn’t specifically test for heterosis, several lines of evidence indicate it may be fueling the lionfish invasion, says Bowen. The hybrids’ huge range suggests they might be stronger and more reproductively successful than their parent species. Invasive lionfish also grow faster and larger. “I bet it’s both,” he adds. Isabelle Côté, a marine ecologist at Simon Fraser University in Burnaby, British Columbia, says the new research is “an amazing new piece of the puzzle.” She says the new findings may call into question past research comparing lionfish in the Atlantic to those in the Indo-Pacific. While the scientists’ findings do not offer new ways to fight the lionfish invasion, Bowen says the discovery underscores the urgency of addressing it, and the need for further research that could lead to a solution. Correction: The original headline of this article was “Invasive Lionfish Are Superfish Hybrids.” Though the fish are indeed hybrids, their “superfish” status remains up for debate. 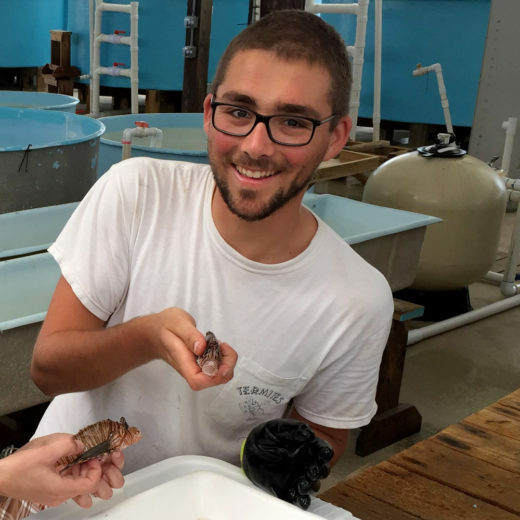 Clay Steell is a master of science candidate at Carleton University in Ottawa, Ontario, but escapes the harsh Canadian winters to research invasive lionfish physiology at the Cape Eleuthera Institute in the Bahamas. He was an editor and writer for his university newspaper before starting grad school. When he’s not obsessing over fish or crunching data, he’s hiking, diving, surfing, or otherwise playing outside. Cite this Article: Clay Steell “Invasive Lionfish May Be Superfish Hybrids,” Hakai Magazine, Aug 16, 2017, accessed April 23rd, 2019, https://www.hakaimagazine.com/news/invasive-lionfish-may-be-superfish-hybrids/.